In India, a man’s pedi-cab business provides income for his family and transportation services to his community. It was made possible, in part, by seventh-grade students at Kent City Middle School. The $100 micro-loan the students provided the entrepreneur last year was part of $12,000 the man requested to finance the business. He has now paid back the $100, which has been added to an account so students can fund more businesses in third-world countries. The students are learning about poverty, math and different cultures while supporting businesses that have ripple effects through entire communities. According to their social studies teacher Marie Davis, the goal is for seventh-graders to fund a businessperson each year and add another $100 to an account for future investing. Davis challenges students to choose someone to invest in through Kiva, a non-profit organization which works with microfinance institutions to provide loans to those without access to traditional banking systems. Anyone can contribute a loan. There are many would-be entrepreneurs to choose from, and studying their situations has been eye-opening students say. Some live in rural, remote areas of the globe where very few resources are available. They may seek loans to sell fish, produce, clothing, livestock and other materials to start or grow their businesses. The challenges they face include disease, drought and war. “I like the fact that you can help someone and change their lives forever,” said student Hannah Van Wert. To raise money for this year’s loan, seventh graders hosted a Hat Day recently. All middle school students could pay $1 to wear a hat to school, which netted $133. Students will soon vote as a class on which entrepreneur to invest in this year. 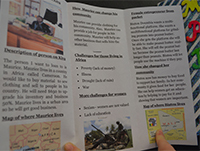 Students created brochures about the business owner they wished to support. Clay Davis chose Babah, a 52 -year-old man in Sierra Leon who hopes to expand his building business. Hannah chose Dede, a woman from Togo who hopes to purchase shoes for her shoe store. Ellie Spielmaker chose Shahbanah, a 44-year-old Pakistani woman who wants to purchase a cow to sell milk. “It helps someone come out of poverty,” said Ellie, explaining why she likes investing. “I loved learning the fact that in other countries there are different types of businesses and different ways of doing business,” Clay said.